Laparoscopic excision of visible endometriosis + laser destruction of the peritoneum including the cul de sac significantly increases your chances of having a successful pregnancy. Peritoneal destruction is associated with significantly higher chances of being successful. The FIRST one focused on what is visible and removes only the endometriotic lesions by excision, we will name this approach endometriotic lesion excision or ELE. The SECOND approach is more extensive and in addition to ELE, the peritoneum is destroyed by laser after excision of all visible lesions with focus on the anterior and posterior cul de sac regardless of the presence of visible lesions. 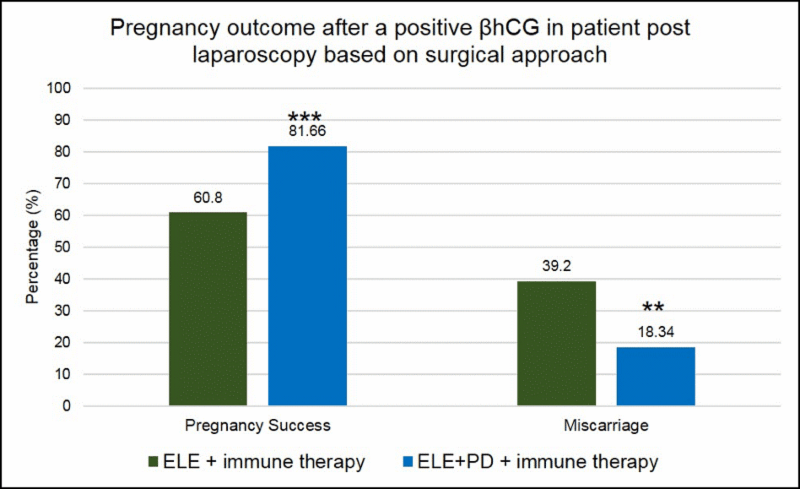 To simplify the graphs presented below, we will name this new approach ELE+ PD (endometriosis lesions excision + peritoneum destruction).By analyzing the pregnancy outcomes in patients undergoing surgical laparoscopy, we noticed a significant and very marked difference between the two groups (ELE vs. ELE +PD). Before going further in explaining how peritoneal destruction (laser destruction of the cul de sac) may give you better chances for pregnancy success, it is important to remind you the different theories of endometriosis as discussed in the section 1 below. We will then show you how endometriosis could affect women’s fertility as presented in the section 2. In the third section, we will explain you why the endometriotic lesions excision only may be less effective in lowering your risk for endometriosis reoccurrence as compared to procedure including peritoneal destruction as seen in Section 4. 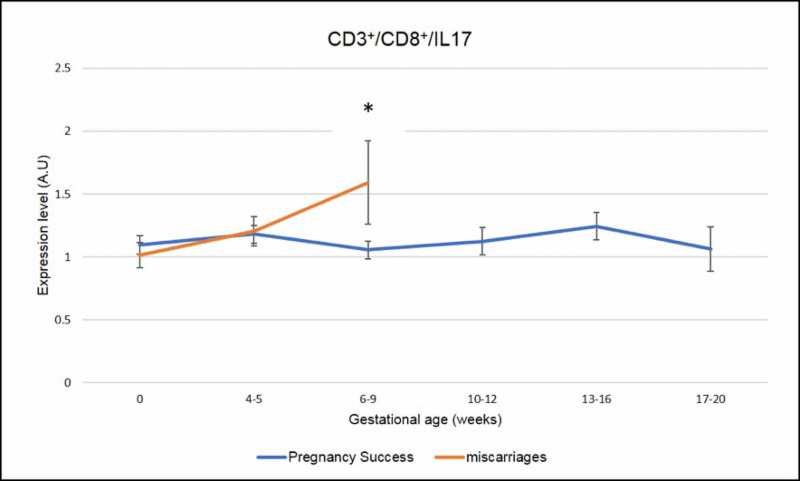 Lastly, we will discuss how peritoneal destruction may modulate immune regulation thus positively impacting your chances for a successful pregnancy. • 90% of women experience retrograde menstruation (4) yet only around 10% of them will experience endometriosis. A larger volume of retrograde menstrual fluid was found in the pelvises of patients with endometriosis as compared with healthy women, which may increase the risk of endometriotic lesions implantation (5). Nevertheless, for most women, these cells will be eliminated by different mechanisms including apoptosis and the activation of the immune system (NK cells), so we can hypothesis that women with endometriosis have also some level of immune dysregulation in addition to retrograde menstruation. Indeed, it is the elevation of NK cells in response to endometriosis (that many incorrectly assume is the primary cause of a patient’s infertility when in fact it is just a marker for the true problem), that requires much more than just treating NK cells with intralipids, a common remedy. • Endometriosis may occur in male (9-11) although it is extremely rare. The coelomic metaplasia theory postulates that endometriosis originates from specialized cells localized in the peritoneum and in the mesothelial lining of the visceral (14). These peritoneal mesothelial cells of coelomic origin can transform into endometrial-like cells by the stimulation of immunological or hormonal factors (15-16). 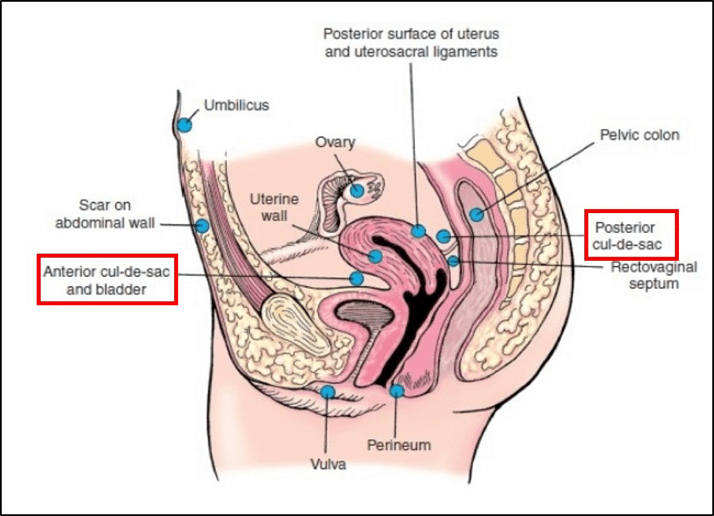 This theory could certainly explain the cases of endometriosis occurring in pre-pubertal girls (7-8) and very rarely occurring in the bladder and prostate of males. • c- Embryologic origin of endometriosis Ectopic endometrial tissue has also been detected in female fetuses at different gestational age (17). It has been suggested that endometriosis could be caused by a defective embryogenesis where the dislocation of primitive endometrial tissue outside the uterine cavity occurred during organogenesis. These cells persist and develop into endometriotic lesions and respond to estrogen (18). • Few days after birth (on days 3-5), vaginal bleeding occurs in neonates due to maternal progesterone withdrawal at birth. • This bleeding is visible in 3%–5%, whereas occult bleeding seems to vary between 25% and 60% (23-24). • When levels of E2 increase, endometriosis can appear even before menstruation. Stem cells can also originate from bone-marrow and differentiate into endometrial-like cells. Animal studies have been performed where stem cells derived from bone marrow of a mice model for endometriosis engraft in the endometrium of wild-type (endo-free) mice showing their potential to initiate the onset of endometriosis (25). Interestingly, exposure to cigarette smoke decreases both the recruitment of bone marrow derived stem cells to the uterus and their differentiation to endometrial cells, a finding linked to reduced rates of endometriosis in smokers (26)! Additional studies are underway to isolate, characterize the component in cigarette smoke that prevents stem cell migration and evaluate their potential benefit as therapeutic agent for endometriosis. It may very be likely that these four theories coexist and could happen concurrently or at different stage during endometriosis progression. Many women with endometriosis undergo infertility treatment including the use of assisted reproductive technologies (ART) such as In Vitro fertilization. Several retrospective studies have put into light an increased rate of miscarriages for women with endometriosis. 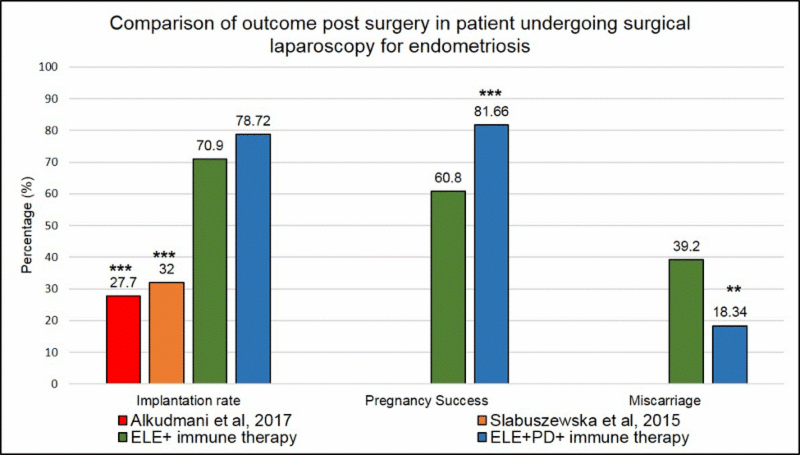 In a recent retrospective study (27) comparing the pregnancy outcome in patients with laparoscopic proven endometriosis versus endometriosis-free patients (who had a laparoscopic surgery for benign gynecological condition), the authors found that 29% of ENDO patients miscarried versus 19% for the control group (endo-free patients). Another analysis showed that this difference is even more accentuated when considering patients with a history of infertility (miscarriage rate of 53% for ENDO patients versus 30% for endometriosis-free patients). However, it is important to note that asymptomatic women are less likely to be referred for surgery and might be underrepresented, further increasing the miscarriage risks above. In a large and systematic review (28) including 92 studies and 78 meta-analysis with a total of over 20 000 women with endometriosis and 122 000 endo-free patients (controls) undergoing ART, the authors found a 31% increase in miscarriage rate in women with endometriosis. Unfortunately, the studies don’t give any details on surgical treatment of the disease before pregnancy that could have modified the occurrence of miscarriages. Inflammation, one of the most prominent characteristic of endometriosis can trigger obstetrical complications. Many recent studies have listed several obstetrical complications ranging from obstetrical bleeding, pre-eclampsia, preterm birth to still birth, whose rates are largely increased in the endometriosis population as compared to endometriosis-free control women. For more information, read our blog on the topic and more specifically on endometriosis in relation to the risk of stillbirth. 3- Endometriotic lesions excision: a good start but is it enough?Regardless of the endometrial cells’ origin (retrograde menstruation, peritoneal mesothelial cells of coelomic origin, stem cells, embryonic cells), the growth and adhesions of endometriotic lesions likely induces an inflammatory environment and a disrupted immune response (29). • endometriosis is clearly associated with inflammation as seen by high levels of pro-inflammatory cytokines such as IL-1α, TNFα, IFN-γ in ENDO patients as compared to endometriosis-free individuals. • removal of lesions modifies the inflammatory profile inducing a shift toward a less inflammatory environment. • this shift is transient and goes back to basal levels (pre-surgery) for most of the cytokines within 3 months post laparoscopy. The study clearly showed that the lesions act as modulators and promoters of inflammation. Most importantly, these observations highlight the potential for recurrence of the disease and the influence of systemic factors on its initiation. • the inflammatory response leading to the establishment and progression of the disease (32-33). In addition, the mesothelium expresses many cell adhesion proteins (review in 31) that may also promote the adhesion seen in endometriosis patients and help with the invasion of the endometriotic lesions. Figure 3: Representation of the peritoneal membrane showing the mesothelial layer, basement membrane and the sub-mesothelial connective tissue with cell populations, structural proteins and vasculature. The pro-inflammatory environment resulting from the endometriotic lesion secretions, macrophages secretions and the recruitment of mononuclear cells from the blood into the peritoneal cavity, may disrupt and polarize the immune cells toward a regulatory profile (more tolerogenic toward the lesions) thus disrupting and even preventing the apoptosis (34), mechanism leading to the destruction and removal of these ectopic endometrial cells. As seen earlier, the peritoneum could be itself a source of endometrial-like cells through coelomic metaplasia. Knowing that women affected by autoimmune disease are more prone to develop endometriosis, it is possible that inflammation, generally associated with autoimmune conditions, could be responsible of the disease onset. In our study, the destruction of peritoneum led to increased pregnancy success even when no visible lesions were identified on the peritoneum. In this group of patients, a recent study (35) determining the success rate of patients with mild endometriosis, showed that women with superficial peritoneal endometriosis have a higher risk of miscarriage (42%) compared to women with ovarian endometriosis (28.6%) and deep infiltrating endometriosis (33.9%). We can hypothesis that endometriosis from coelomic metaplasia origin may induce a stronger immune response (as seen in the previous paragraph) than endometriosis of retrograde menstrual flow origin, impacting more severely chances for successful pregnancy. Therefore the destruction of the peritoneum may further benefit your chances for a successful pregnancy. • further it is a source of factors amplifying inflammation and enhancing the adhesiveness and infiltration of endometriotic lesions. In addition, the existence of occult microscopic foci of endometriosis have been reported in visibly normal peritoneum in women with and without diagnosed endometriosis (36). This highlights the key role of the peritoneal membrane in the occurrence and/or progression of the disease as well as the production of cells and cytokines causing local and systemic inflammation. As seen in Figure 1, our first observation highlights the fact that peritoneal destruction is associated with significantly higher chances of being successful. There are very few scientific publications analyzing pregnancy success post laparoscopic surgery in patients affected by endometriosis. If we consider the implantation rate (positive βhCG post transfer or after spontaneous conception), our surgical approaches in addition to our immune therapy protocol are more efficient in allowing patients to get pregnant as seen in the Figure 4 below. Our implantation rate (ELE only in addition to immune therapies or ELE+PD in addition to immune therapies ) are significantly higher (2.5-fold) than the one reported in Alkudmani’s study where lesions were lasered by CO2 vaporization (37) or in Slabuszewska’ study (38) where lesions ablated were present in the recto-vaginal area. Besides, the beneficial effects of our surgeries in restoring a more tolerogenic environment, the higher implantation rate in our patients could beattributed to our immune therapies and our dietary supplements providing a better support to egg and embryo quality by reducing inflammation, improving mitochondrial egg function and reducing oxidative stress, all dramatically impacting chances of being successful. *** means that the p-value is <.001 and the difference seen between our surgical approaches in addition to our immune therapies and the published studies is highly significant. 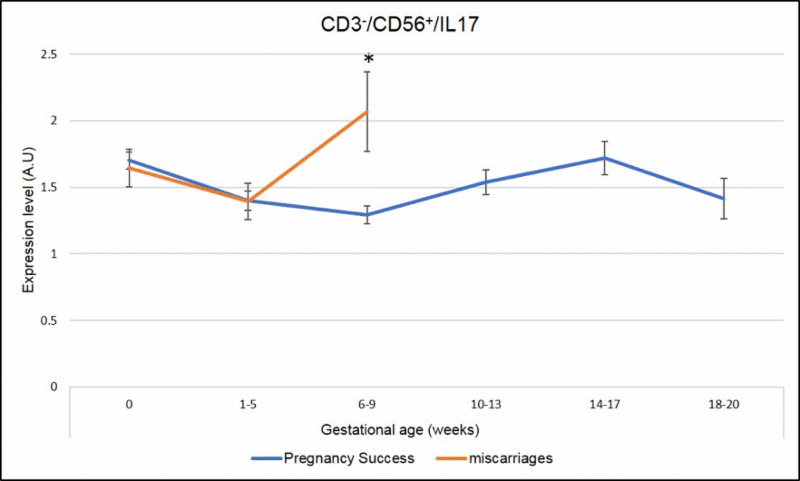 Figure 6: Miscarriages are associated with a pick of CD3-CD56+ IL-17 producing cells (NK-IL-17) on week 6-9 of pregnancy. * Means that the p-value is <.05 which indicates a significant difference. 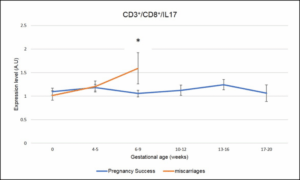 In addition, and specifically in ENDO patients (N=219 pregnancies analyzed), a significant increase in CD3+CD4+IL-17 (Th17) also correlates with miscarriages at 6-9 weeks of pregnancy as seen in Figure 7 (the red line is higher than the blue line, * means that the difference seen is significant with a p-value <.05). 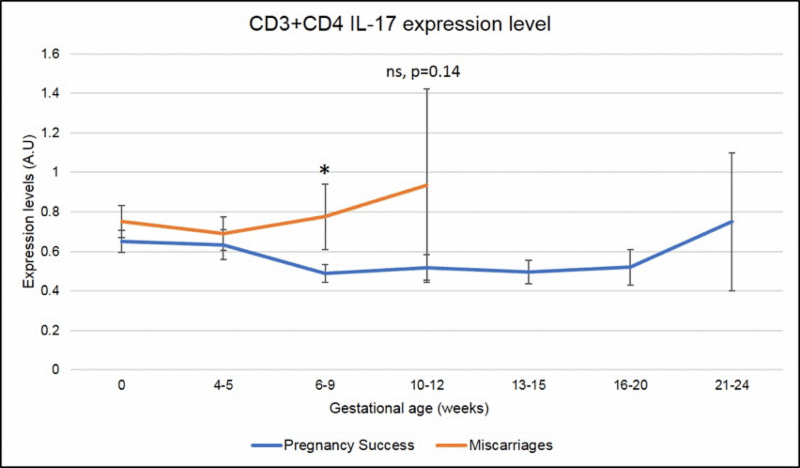 Figure 7: Miscarriages are associated with a pick of CD3+CD4+ IL-17 producing cells (Th17) on week 6-9 of pregnancy. * means that the p-value is <.05 which indicates a significant difference. 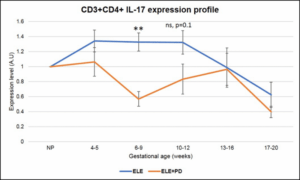 Focusing on these three parameters, Tc17, NK-17 and Th17, we wanted to determine if the surgical technique ELE or ELE+PD differentially alters the immune profile during the early stages of pregnancy. In other words, can the peritoneum destruction place a patient in a more tolerogenic immune profile thus allowing the progression of a pregnancy? 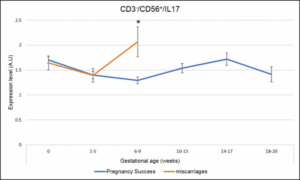 To this end, we compared the immune profile across the different stages of pregnancy (including successful pregnancy with progression to term and pregnancies that will end up with a miscarriage) based on the surgical approach: ELE with PD (N=47 pregnancies) or ELE without PD (N=142 pregnancies). 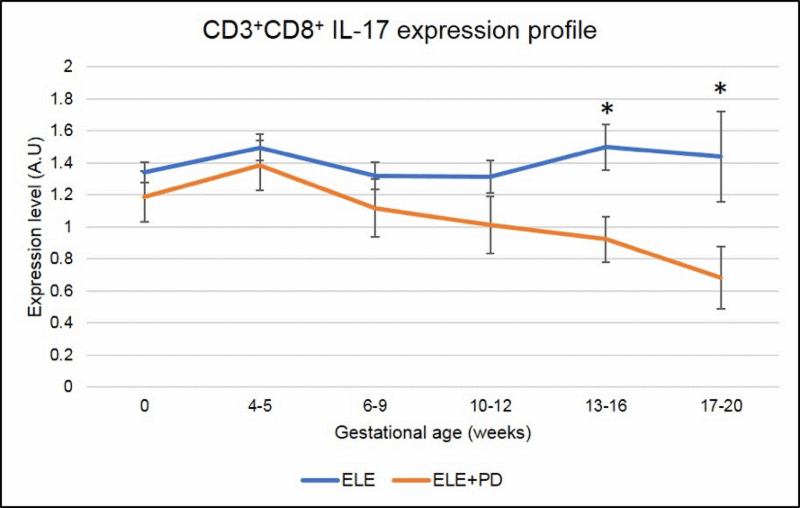 Strikingly, all markers of pregnancy losses, namely Tc17 (Figure 8), NK17 (Figure 9) and Th17 (Figure 10) are significantly decreased in pregnancy achieved post ELE+PD (red line) as compared to ELE only (blue line). * Means that the p-value is <.05 which indicates a significant difference. 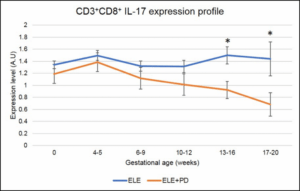 Figure 8: CD3+CD8+ IL-17 producing cells (Tc17) expression is significantly lower in pregnancy after ELE+PD as compared to ELE only. * Means that the p-value is <.05 which indicates a significant difference. 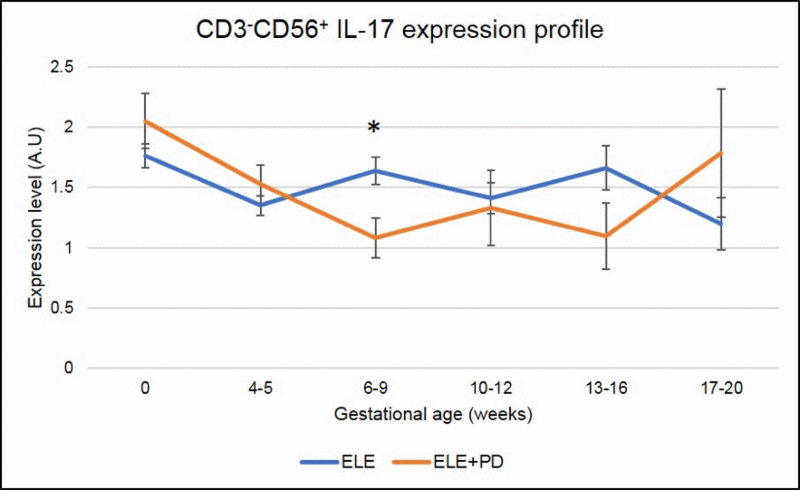 Figure 9: CD3-CD56+ IL-17 producing cells (NK17) expression is significantly lower in pregnancy after ELE+PD as compared to ELE only. * Means that the p-value is <.05 which indicates a significant difference. 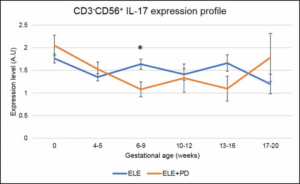 Most importantly, Th17 cells expression, subset of cells known to contribute to the pathogenesis of endometriosis (37) and found to be strongly associated with miscarriages in our ENDO population, is dramatically reduced in pregnancies achieved post ELE + PD as seen in the Figure 9 below (the red line ELE+PD is strongly and significantly reduced as compared to the blue one representing pregnancies achieved post ELE only).This puts into light the fact that pregnancies post ELE + PD are most likely to succeed than pregnancies achieved post ELE only, as seen by the significantly higher rate of pregnancy success in Figure 1 (i.e 82% vs. 60%). 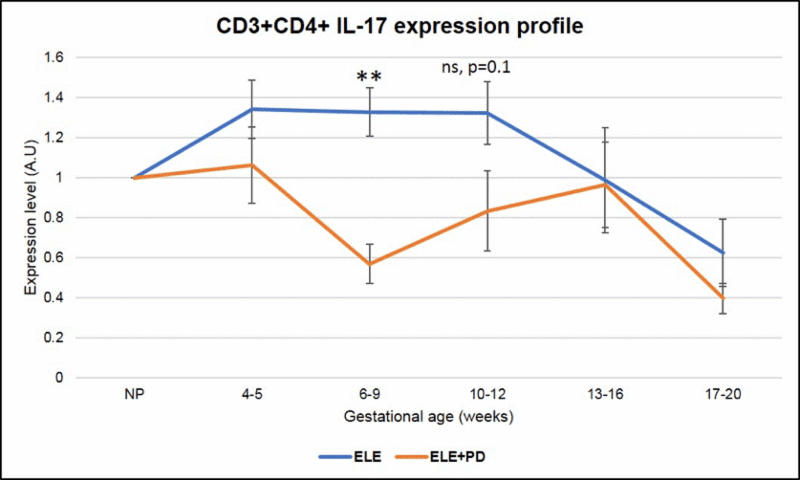 Figure 10: CD3+CD4+ IL-17 producing cells (Th17) expression is significantly lower in pregnancy after ELE+PD as compared to ELE only. ** Means that the p-value is <.01 which indicates a highly significant difference. Peritoneal destruction induces a more tolerogenic uterine environment when combined with endometrial lesion excision resulting in a higher successful pregnancy rate. 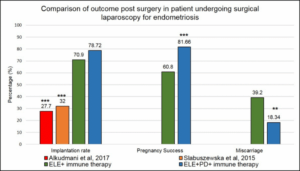 It is now our recommendation that those patients with Immunologic and clinical evidence for endometriosis, even if MINIMAL or NO LESIONS are identified, undergo ELE+ PD. Therefore, some of our patients that have had only excision of endometriosis without PD and continue to fail fertility treatments, are now recommended to repeat a laparoscopic surgery to include PD. Although the number of cases is limited, we have seen improvement in these patients’ success rates as well. (There are not enough cases yet to validate this claim and this part of the study is ongoing but looks promising).Endometriosis is a complex disease where genetic, environmental factors, diet and inflammatory disorders can play a role in the initiation and progression of the disease. There is no simple solution to this very complicated disorder and at Braverman Reproductive Immunology, we offer a full program to counteract the deleterious effects of endometriosis on our patient’s fertility. This ranges from laparoscopic surgery with lesions excision and peritoneal destruction to immune therapy to minimize and control the inflammation during pregnancy. In addition, we have developed two supplements Endo-Optimize supplementand Endo-Optimize probiotic that could help in restoring your egg mitochondrial function, for more information read our blog on the topic. These two supplements may help improve your egg and embryo quality by reducing inflammation, oxidative stress and its associated DNA damage. Further, many of the ingredients included in our supplements may have beneficial impact on endometriosis. For more information, read our blog. 1- Buck Louis, G.M., Hediger, M.L., Peterson, C.M., Croughan, M., Sundaram, R., Stanford, J., Chen, Z., Fujimoto, V.Y., Varner, M.W., Trumble, A., Giudice, L.C., 2011. Incidence of endometriosis by study population and diagnostic method: the ENDO study. Fertil. Steril. 96, 360–365. 2- Giudice, L.C., Kao, L.C., 2004. Endometriosis. Lancet 364, 1789–1799. 3- Rawson JM. Prevalence of endometriosis in asymptomatic women. JRM 1991; 36:513–5. 4- I. E. Sasson and H. S. Taylor, “Stem cells and the pathogenesis of endometriosis,” Annals of the New York Academy of Sciences, vol. 1127, pp. 106–115, 2008. 5- P. R. Koninckx, S. H. Kennedy, and D. H. Barlow, “Endometriotic disease: the role of peritoneal fluid,” Human Reproduction Update, vol. 4, no. 5, pp. 741–751, 1998. 6- Bidarmaghz B, Shekhar A, Hendahewa R. Sigmoid endometriosis in a post-menopausal woman leading to acute large bowel obstruction: A case report. Int J Surg Case Rep. 2016; 28: 65-67. 7- P. G. M. Figueira, M. S. Abr˜ao, G. Krikun, and H. Taylor, “Stem cells in endometrium and their role in the pathogenesis of endometriosis,” Annals of theNew York Academy of Sciences, vol. 1221, no. 1, pp. 10–17, 2011. 8- I. Brosens, S. Gordts, and G. Benagiano, “Endometriosis in adolescents is a hidden, progressive and severe disease that deserves attention, not just compassion,” Human Reproduction, vol. 28, pp. 2026–2031, 2013. 9- Pinkert TC, Catlow CE, Straus R. Endometriosis of the urinary bladder in a man with prostatic carcinoma. Cancer 1979;43: 1562 7. 10- Fukunaga M. Paratesticular endometriosis in a man with a prolonged hormonal therapy for prostatic carcinoma. Pathol Res Pract 2012; 208:59 61. 11- Simsek G, Bulus H, Tas A, Koklu S, Yilmaz SB, Coskun A. An unusual cause of inguinal hernia in a male patient: Endometriosis. Gut Liver 2012; 6:284 5. 12- Pankratjevaite L, Samiatina-Morkuniene D. A case report of thoracic endometriosis – A rare cause of haemothorax. Int J Surg Case Rep. 2017;33: 139-142. 13- Nair SS, Nayar J. Thoracic Endometriosis Syndrome: A Veritable Pandora’s Box. J Clin Diagn Res. 2016 Apr;10(4): QR04-8. 14- P. Gruenwald, “Origin of endometriosis from the mesenchyme of the celomic walls,” American Journal of Obstetrics and Gynecology, vol. 44, no. 3, pp. 470–474, 1942. 15- S. Gupta, A. Agarwal, N. Krajcir, and J. G. Alvarez, “Role of oxidative stress in endometriosis,” Reproductive BioMedicine Online, vol. 13, no. 1, article 2291, pp. 126–134, 2006. 16- A. Augoulea, A. Alexandrou, M. Creatsa, N. Vrachnis, and I. Lambrinoudaki, “Pathogenesis of endometriosis: the role of genetics, inflammation and oxidative stress,” Archives of Gynecology and Obstetrics, pp. 1–5, 2012. 17- Signorile PG, Baldi F, Bussani R, Viceconte R, Bulzomi P, D’Armiento M, D’Avino A, Baldi A. Embryologic origin of endometriosis: analysis of 101 human female fetuses. J Cell Physiol. 2012 Apr;227(4):1653-6. 18- R. O. Burney and L. Giudice, “Pathogenesis and pathophysiology of endometriosis,” Fertility and Sterility, vol. 98, pp. 511–519, 2012. 19- F. R. Oliveira, C. D. Cruz, H. L. del Puerto, Q. T. M. F. Vilamil, F. M. Reis, and A. F. Camargos, “Stem cells: are they the answer to the puzzling etiology of endometriosis?” Histology and Histopathology, vol. 27, no. 1, pp. 23–29, 2012. 20- H. Masuda, Y. Matsuzaki, E. Hiratsu et al., “Stem cell-like properties of the endometrial side population: implication in endometrial regeneration,” PLoS ONE, vol. 5, no. 4, Article ID e10387, 2010. 21- Nyholt DR, Low SK, Anderson CA, Painter JN, Uno S, Morris AP, MacGregor S, Gordon SD, Henders AK, Martin NG, Attia J, Holliday EG, McEvoy M, Scott RJ, Kennedy SH, Treloar SA, Missmer SA, Adachi S, Tanaka K, Nakamura Zondervan KT, Zembutsu H, Montgomery GW. Genome-wide association meta-analysis identifies new endometriosis risk loci. Nat Genet. 2012 Dec;44(12):1355-9. 22- Gargett CE, Schwab KE, Brosens JJ, Puttemans P, Benagiano G, Brosens I. 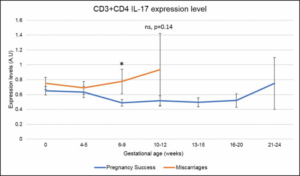 Potential role of endometrial stem/progenitor cells in the pathogenesis of early-onset endometriosis. Mol Hum Reprod. 2014 Jul;20(7):591-8. 23- Brosens I, Puttemans P, Benagiano G. Endometriosis: a life cycle approach? Am J Obstet Gynecol 2013 Mar 15. 24- Brosens I, Brosens J, Benagiano G. Neonatal uterine bleeding as antecedent of pelvic endometriosis. Hum Reprod. 2013 Nov;28(11): 2893-7. 25- Du H, Taylor HS. Contribution of bone marrow-derived stem cells to endometrium and endometriosis. Stem Cells. 2007 Aug;25(8):2082-6. 26- Zhou Y, Gan Y, Taylor HS. Cigarette smoke inhibits recruitment of bonemarrow- derived stem cells to the uterus. Reprod Toxicol 2011; 31:123–127. 27- Santulli P, Marcellin L, Menard S, Thubert T, Khoshnood B, Gayet V, Goffinet F, Ancel PY, Chapron C. Increased rate of spontaneous miscarriages in endometriosis-affected women. Hum Reprod. 2016 May;31(5):1014-23. 28- Barbosa MA, Teixeira DM, Navarro PA, Ferriani RA, Nastri CO, Martins WP. Impact of endometriosis and its staging on assisted reproduction outcome: systematic review and meta-analysis. Ultrasound Obstet Gynecol. 2014 Sep;44(3):261-78. 29- Bulun SE. Endometriosis. N Engl J Med. 2009; 360:268–279.